You Don’t Have To Become A Thru-Hiker To Become A Backpacker | "What Goes Down, Must Come Up!" 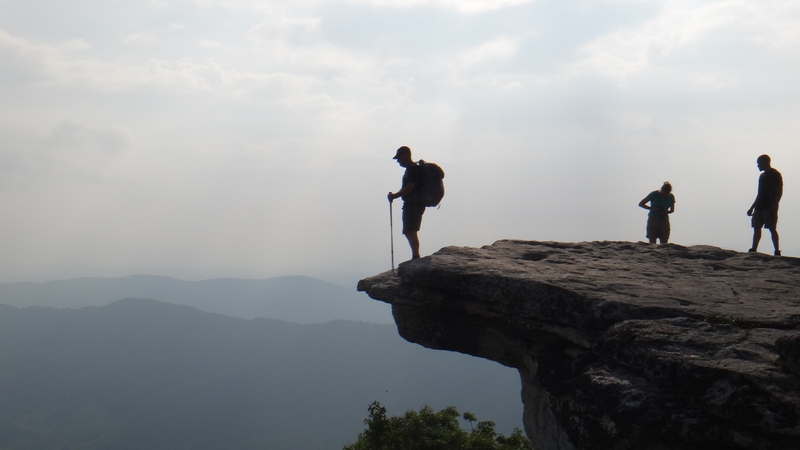 If you’re reading this, odds are, you are probably NOT a ‘thru-hiker’ – But that doesn’t mean that you can’t learn to be one. In fact, you’re probably not a backpacker at all! most epic journeys that the average person will ever undertake. You probably even live a little vicariously through these special backpackers on their grand adventure. But sometimes reading about these fantastic mileages – 2000, 3000 mile hikes, 25 mile days, pack weights so low they seem impossible, can be so intimidating. And equipment! Equipment so varied, so specialized, (and expensive!) it’s easy to just say, why bother, I’ll just stay at home and read about it. Thru-hiking is at one end of the spectrum, weekend backpacking trips are at the other. Professional athletes just don’t walk on to a pro team, there is a logical start up, just like backpacking. I have read many stories of thru-hikers who have said they had never hiked at all before deciding to “do” the AT or PCT. They just up and decided to do it, went out and bought some gear and with a little food and planning (or not) just started walking, after all, it is just walking. A few of those even make it to the end the first time around, but all invariably learn and adjust as they go, but not without a lot of pain and anguish. This would be the exception of the rule of learning how to backpack. If you want to get away from the trail head, away from the campground and get into the forest and into the mountains, I say… you can do it. Anyone can do it. I work with many folks brand new to backpacking or those who want to try it. It’s so easy to say, just get a pack and go! In reality, so many of us have jobs and mortgages, and kids in school, so we’re not taking off 6 months out of the year to hike. The one thing that you and I have in common with the “thru-hiker”, is a sense of and longing for adventure. And backpacking is that ultimate adventure that is right here, right in front of us, available for the taking! The sphere of knowledge around backpacking and the things you will learn, and the confidence you will gain is almost unbelievable. I have had said for years that backpacking is actually a gateway drug for mountaineering. You will learn about tents, and shelters, and ground cloths, and stoves (and stoves and more stoves..), and fuels, and little teeny pots, and long handled spoons. You’ll learn hundreds of foods that you can pack in baggies and cook with just a little boiling water. You will learn about first aid – and making a kit that fits in a very very small stuff sack. You’ll discover maps and navigation tools that you never even knew existed. You’ll gain knowledge about animals, and vegetation, and hanging ‘bear bags’. You’ll develop new a understanding of the insulating values of sleeping bags, and water bottles, quick drying fabrics, layering, and boots. OMG you’ll learn about sandals, and trail runners, and lightweight boots. You’ll become an expert on the pros and cons of waterproof footwear. You’ll learn about ten different ways to purify water, and how much water that you personally need to carry. And you’ll learn how to carry all this stuff on your back and into the wilderness! And you will love it. And it will change you… forever. And you don’t need to hike 25 miles or 3000 miles to learn it, to enjoy it. You will need to find a place you want to visit, a friend or friends to go with, maybe a local hiking group, maybe to a nearby National Forest or State campground, but you do have to take that first step out of your car and get started. And having the right equipment? Here’s a little secret, there isn’t a backpacker alive who doesn’t own multiple sleeping bags, multiple tents, and for Gosh sakes, multiple stoves! Accumulate what you think you’ll need to sleep and cook a meal, maybe go in the spring or summer, (IMHO winter is not the best time to start) and I guarantee you’ll start making adjustments to your kit. And if you can’t find anyone to go with…well, just give me a call, we can learn together. This entry was posted in Backpacking, Wind River Range on April 8, 2017 by Dragin.